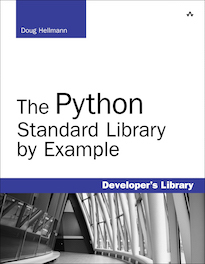 If you find this information useful, consider picking up a copy of my book, The Python Standard Library By Example. The output from all the example programs from PyMOTW has been generated with Python 2.7.8, unless otherwise noted. Some of the features described here may not be available in earlier versions of Python. 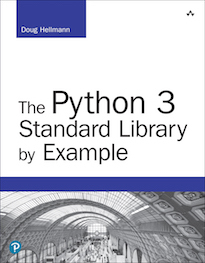 If you are looking for examples that work under Python 3, please refer to the PyMOTW-3 section of the site. Now available for Python 3! As with threads, a common use pattern for multiple processes is to divide a job up among several workers to run in parallel. Effective use of multiple processes usually requires some communication between them, so that work can be divided and results can be aggregated. A simple way to communicate between process with multiprocessing is to use a Queue to pass messages back and forth. Any pickle-able object can pass through a Queue. This short example only passes a single message to a single worker, then the main process waits for the worker to finish. Doing something fancy in Process-1 for Fancy Dan! A more complex example shows how to manage several workers consuming data from a JoinableQueue and passing results back to the parent process. The poison pill technique is used to stop the workers. After setting up the real tasks, the main program adds one “stop” value per worker to the job queue. When a worker encounters the special value, it breaks out of its processing loop. The main process uses the task queue’s join() method to wait for all of the tasks to finish before processin the results. Although the jobs enter the queue in order, since their execution is parallelized there is no guarantee about the order they will be completed. The Event class provides a simple way to communicate state information between processes. An event can be toggled between set and unset states. Users of the event object can wait for it to change from unset to set, using an optional timeout value. """Wait for the event to be set before doing anything"""
"""Wait t seconds and then timeout"""
When wait() times out it returns without an error. The caller is responsible for checking the state of the event using is_set(). In situations when a single resource needs to be shared between multiple processes, a Lock can be used to avoid conflicting accesses. In this example, the messages printed to the console may be jumbled together if the two processes do not synchronize their access of the output stream with the lock. Condition objects can be used to synchronize parts of a workflow so that some run in parallel but others run sequentially, even if they are in separate processes. """perform first stage of work, then notify stage_2 to continue"""
"""wait for the condition telling us stage_1 is done"""
In this example, two process run the second stage of a job in parallel, but only after the first stage is done. Sometimes it is useful to allow more than one worker access to a resource at a time, while still limiting the overall number. For example, a connection pool might support a fixed number of simultaneous connections, or a network application might support a fixed number of concurrent downloads. A Semaphore is one way to manage those connections. In this example, the ActivePool class simply serves as a convenient way to track which processes are running at a given moment. A real resource pool would probably allocate a connection or some other value to the newly active process, and reclaim the value when the task is done. Here, the pool is just used to hold the names of the active processes to show that only three are running concurrently. In the previous example, the list of active processes is maintained centrally in the ActivePool instance via a special type of list object created by a Manager. The Manager is responsible for coordinating shared information state between all of its users. By creating the list through the manager, it is shared and updates are seen in all processes. Dictionaries are also supported. In addition to dictionaries and lists, a Manager can create a shared Namespace. Any named value added to the Namespace is visible to all of the clients that receive the Namespace instance. It is important to know that updates to the contents of mutable values in the namespace are not propagated automatically. ns.my_list.append('This is the value') # DOES NOT UPDATE GLOBAL VALUE! To update the list, attach it to the namespace object again. The Pool class can be used to manage a fixed number of workers for simple cases where the work to be done can be broken up and distributed between workers independently. The return values from the jobs are collected and returned as a list. The pool arguments include the number of processes and a function to run when starting the task process (invoked once per child). The result of the map() method is functionally equivalent to the built-in map(), except that individual tasks run in parallel. Since the pool is processing its inputs in parallel, close() and join() can be used to synchronize the main process with the task processes to ensure proper cleanup. By default Pool creates a fixed number of worker processes and passes jobs to them until there are no more jobs. Setting the maxtasksperchild parameter tells the pool to restart a worker process after it has finished a few tasks. This can be used to avoid having long-running workers consume ever more system resources. The pool restarts the workers when they have completed their allotted tasks, even if there is no more work. In this output, eight workers are created, even though there are only 10 tasks, and each worker can complete two of them at a time.